A few weeks ago, I stood at the top of the highest tower of a very high castle indeed. 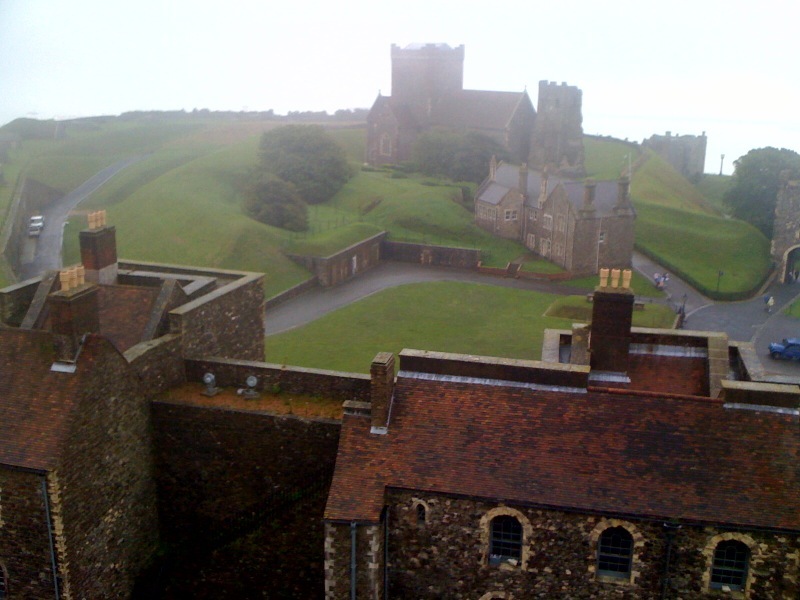 I savoured a thousand-year-old view, swathed as it was in sea mist. And I wondered what those soldiers, almost a thousand years ago, must have felt, as they patrolled its damp, cold walls waiting for the agression of others. Those tiny pawns had been watching out on the site for even longer. Even Roman soldiers could be insignificant links in a vast chain of authority, trudging back and forth with feet they could not longer feel because, lets face it, Britannia is Britannia, when all is said and done. If you want warm feet, get posted to Egypt. They stood waiting for something to happen. Very occasionally, it did. In 1216, the soldiers here watched a siege take hold, with men scheming and streaming like ants below. Much later, the nearby cliffs gave a view across the sea which helped to save hundreds of thousands of lives and guarantee a country’s freedom, arguably the freedom of a much wider free world. That view, that’s an important part of making oneself safe and comfortable. One can see the danger as it appears over the horizon, as the dog demonstrates so ably so very often. Despite all the advances in canine psychology, and all those dog whisperers out there, no-one has yet managed to communicate to our four-legged terrier friends that we are no longer in the Stone Age. Therefore, when it is bedtime, our canine family member spends three fastidious minutes treading down rushes which aren’t there. Round and round and round and round, on what is actually a flat, fairly comfy cushion. Pointless. His choice of vantage point is equally primeaval. He has a certain place in the house where he brings his conquests. His beloved party bags, stolen furtively while children play happily and unawares; a slice of pizza, passed under the table by the man of the house, who knows such transfers are verboten; a french loaf, filched by teetering on some kitchen stool to access the kitchen working surface. All are transported shiftily to Macaulay’s Special Place. It sits at a cruciform junction in our singluar house. From it, the dog can see who is about to walk through the front door; who might emerge from the kitchen to reclaim that loaf; potential party-bag-retrieving search parties coming from upstairs; and any approach from the chief threat to his foraging, the woman of the house. It is unfortunate for the hound that our house has much the same number of traffic and people movements as Clapham Junction station. Vantage is no boon, when the world overruns one’s chosen sanctuary. The dog rarely gets away with anything. And even if he is allowed to keep his pizza, there is a chuckling audience reviewing his every guilty chomp. In the pages of a tempestuous book towers my favourite vantage point. From it, a woman bereft of her wits must go through many kinds of hell. She sails across the world in the grip of insanity, from the warm shores of the West Indies, and by the time we meet her, she has the highest view in the great mansion of Thornfield Hall. Her name is Bertha Rochester, and her husband is Edward Rochester, the man who sweeps a little governess called Jane Eyre off her feet. Just as children were often pensioned off to the highest room in the house, the taciturn Mr Rochester gives his wife a room on the top floor. She must have ample time to watch his courtship with the successor he has chosen. It must be intolerable to bear his scheming towards the ultimate betrayal. How very far away those warm shores must seem. Of course she is a very dangerous woman, as all the books tell us. But in The Wide Sargasso Sea, Jean Rhys attempts to put her imprisonment in context, to give the woman with no voice a story of her own. Her story shows us that a clear view of the opposition does not necessarily lead to safety or happiness. Her very height becomes the instrument of her undoing. I have just returned from a night run. A good friend came with me, and we ran up to a place which has been a vantage point for thousands of years: an iron age fort. As we headed out, without torches, it was dusk. I have just this minute returned, happy and muddy, in pitch black. I know the fort like the back of my hand, but tonight this flat plateau was like another land. I could not see the forest cascading away. I could not even see the ground at my feet. Once upon a time, this ground was crowded with squat round houses. On a warm evening such as this in 500BC, there would be people sitting out, watching the ice blue last vestiges of light above the trees. There would be cattle, and enclosures for farming, and a form of companionship and civilisation. But no light must mean no vantage, mustn’t it? If you can’t see the agressor coming, they can attack so much more effectively. Tonight I perceived a whole new layer of meaning to the words ‘under the cover of darkness’. Time has brought us a vantage point: invented by Thomas Edison, the light bulb will illuminate future visits to the forest. I won’t forget my torch next time. Hmmmmm now l can settle! Taz has three of vantage points,top of the stairs and both sofas,one so he can see out onto the garden the other the the front door and the top of the stairs everywhere up and down….. They like to know where they stand, these dogs, don’t they? Bet Taz doesn’t steal as much as Mac…..
His very good!! He will eat anything that Bec’s feeds him, everyone else his not so sure! But loves french bread…….. I loved Rhys’s book and often use quotes from it to kick-start a piece of my own writing. As for stealing and hoarding, Lulubelle is teaching Diski well and a favourite slipper has been felled; its sad corpse was discovered this morning. It is one of the great contradictions that Jane Eyre, written by a clever, well-read woman about a free-thinking, independent woman, never gives Bertha a voice. I am always thankful to Rhys for doing that, and so very beautifully. I am rather shallow though, and find the sadness hard to bear. I can quite imagine what that slipper must have looked like by the time you got to it. And how it must have felt. Canine conquests are rarely pretty, are they? Dogs and their food stashes – love it! It may be a no no for me too Liz….I simply never entertained the idea before, and it’s one way of denying the full extent of those dark nights. One plus: the forest smalls great when you can’t see a thing. Funnily enough I was thinking of one this morning about insomnia and how utterly pointless it is!!!! If you haven’t guessed I have had a bout of it lately… I shall make some notes and consider writing something soon.. Just a little worried of making a fool of myself!!! A very good idea, that torch Kate. Even that may not be enough to see danger. The right thing is to be aware of how quickly darkness falls. That’s the real vantage point. Fair point, Dad. With lights, mates and a mobile I should be fine. It is not Gruffalo season. Buster, our long gone Jack Russell terrier, used to circle before settling down. And I used to throw Spratts ovals for him to chase. He would take the newly acquired oval biscuit and put it carefully in a corner before his nose went through the motions of covering the biscuit with imaginary earth. Primeval behaviour , no doubt! 😀 I remember Buster circling, but not the barmy biscuit behaviour. That would have been something to watch. Lovely to read about your dogs, Kate, as well as your run…good for you! As for vantage points, our dogs have absolutely nothing on our cat! You are so right about that. You can always bet Kit Kat has the best view in the house, although she lacks that shifty guilt-ridden quality that the dog wears so well. She knows she is above all else. Don’t know if you’re back home yet – the trip blogs have been inspiring! What a beautiful view and a great post.